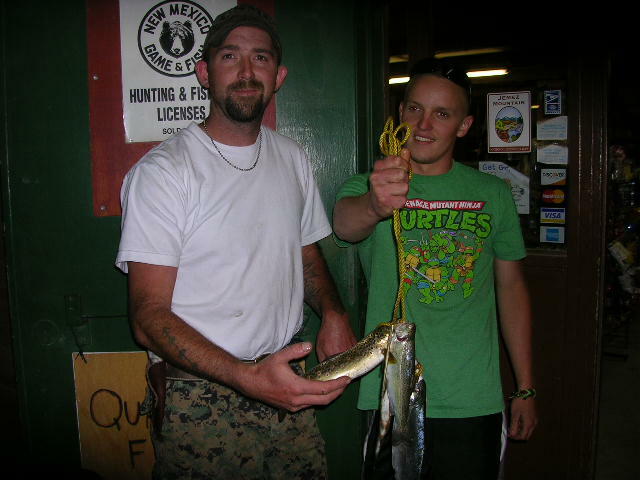 Saturday, June 7, 2014 is Free Fishing Day in the Jemez and throughout the State of New Mexico. All anglers, residents and non-residents, may fish free on public waters statewide. No one needs a license or stamp, although bag limits and all other rules and regulations apply. Thank-you to all that have served this great country and have made the ultimate sacrifice. We honor you this Memorial Day, 2014. No matter our political views or the politics of war, I hope we can all agree that we owe a debt of gratitude to our fallen heroes. Normally I would not look forward to a rainy Memorial Day Weekend, but this will be a welcome event….if the weather forecasters are on target. Imagine the rain cooled air, the roads no longer choked with dust and the warmth of your campfire as you sit among family and friends and enjoy the beauty of the Jemez Mountains. This is going to be a special three day weekend. 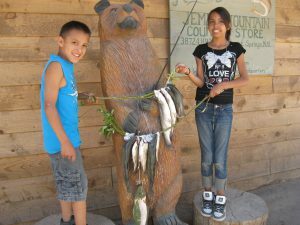 Most waters in the Jemez have been stocked heavily over the last five or six weeks with rainbow trout that fit nicely in any frying pan. Campgrounds are open, forest roads offer dispersed camping opportunities and there are no fire restrictions. Hot springs beckon. Hiking trails call your name. All sorts of recreation may lure you to a very special part of New Mexico….the Jemez Mountains. We invite you to the Jemez to make family memories and enjoy the enchantment of the New Mexico outdoors. I realize that I am ‘preaching to the choir here, but please be very careful with your campfires this weekend and please ‘pack it in…pack it out’…trash that is. This appears to be unique year for recreation in the Jemez Mountains of New Mexico. With unprecedented low winter snowpack, no runoff and an early thaw to Fenton Lake, we are already experiencing late spring conditions here in the Jemez. The streams are running clear and quite low for early April, but are fishing very well. The lake is also fishing quite well and has been, ever since the ice came off about a month ago. My advice is get on up to the Jemez sooner than later this spring, as the best conditions will probably be in April this year….at least until we can get into the monsoon season in July and August. May and June are our hottest and driest months historically. High fire danger, fire restrictions and possible forest closures will contribute to limited camping and recreational activities. Hot and dry conditions will also cause an early algae bloom in the lake that will limit or curtail stocking activities. Likewise, with the streams, low and warm water conditions can restrict stocking activity to certain Jemez streams. I don’t like to sound pessimistic, but this is the reality of the situation. The NMDGF will be stocking heavily throughout the month of April. Check back often with our JemezCentral stocking report for up to the minute stocking information. Jemez Falls Campground is scheduled to open on April 19, 2014 (about a month earlier than normal). San Antonio Campground (reservation only) is scheduled for an April 29th opening (also early). I may have some exciting news concerning Redondo Campground soon, so stay tuned. Vista Linda Campground, of course, is open year round. Forest roads 144 and 376 (to the south) are scheduled to open on April 15th. These openings will provide for good camping opportunities for both improved and dispersed camping. In spite of the fact that we received from 2-6 inches of new snow today (April 3rd), the Jemez Mountains remain very dry. The fire danger is listed as HIGH. There are, however, no fire restrictions at this time. I realize that I am ‘preaching to the choir’ here, but please be extremely careful and responsible with your campfires. Once again, my advice is to get on up to the mountains now (April) while the getting is good. Stick with JemezCentral.com and I will keep you updated with the most current developments….be they good….or bad. The old timers in the area have told me of days past when they measured snowstorms in feet. Since I moved to the Jemez Mountains in 1989, we have measured snow events in inches. Now it seems that we measure snowfall by the number of snowflakes that we can count. Of course that is an exaggeration, but sadly, it is not far off. And, we are not alone. The entire southwestern part of the US, including much of California, has been affected by a persistent high pressure system that is diverting the winter weather far to the north. So far this winter season, I have measured 12 inches of total snowfall. Last year I measured 72 inches and the year before that….96 inches. Needless to say, this winter is shaping up to be one of the driest in a long, long time. I remember the winter of 2001-2002 that a grand total of 13 inches fell in this area. However, according to the ‘Farmer’s Almanac’, the Southwest is predicted to have cold and snowy weather the first and last part of February and the first part of March. I am hoping that the Almanac is correct. Many swear by it. As of this writing, the NWS forecast is calling for a chance for stormy weather tomorrow (January 30) through the weekend and into next week. We can only hope. So what does this mean? If we do not have significant moisture this late winter and into the spring, the Jemez Mountains will once again become a tinderbox susceptible to wildfire. 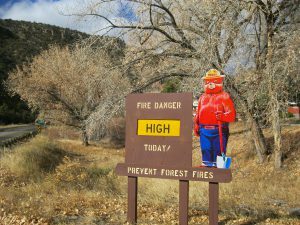 The reality is that because of extreme fire danger within the Santa Fe National Forest, Jemez Ranger District, the forest and campgrounds could be closed to public use early and often. I am not trying to be an alarmist, but these are the facts as we have them right now. My advice is to keep your eye on this website for up to the minute information and plan your Jemez recreation early this year. With an early ice off at Fenton Lake, some of the best fishing of the year can be March and April. There will be virtually no runoff this spring in the rivers, so plan your river fishing early as well. The forest roads usually open around April 1st, and perhaps earlier this year, providing opportunities for dispersed camping. Who knows, perhaps the Forest Service will open the campgrounds earlier than their normal early May opening. On the other hand, we can hope that the ‘Farmers Almanac’ will prove correct and we can start measuring our snowfall in inches (or feet) this late winter. Wouldn’t that be dandy. Do your best snow dance and let’s hope for the best. Happy Thanksgiving to all. No matter our situation in life, we all have much to be thankful for. I know I do. Enjoy the day, love those around you, provide for those less fortunate, safe travels and good eats. 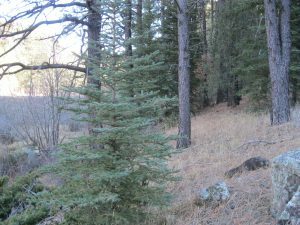 There is much to do in the Jemez this time of year. While some of the Forest Roads are muddy, snowy or icy, all of the highways are in good condition. Check with JemezCentral.com for current weather and road conditions. Whether you come to the Jemez to hunt, fish, gather firewood, camp, enjoy the hot springs, or just want to get out of town, be sure and stop in to Amanda’s and say hi. 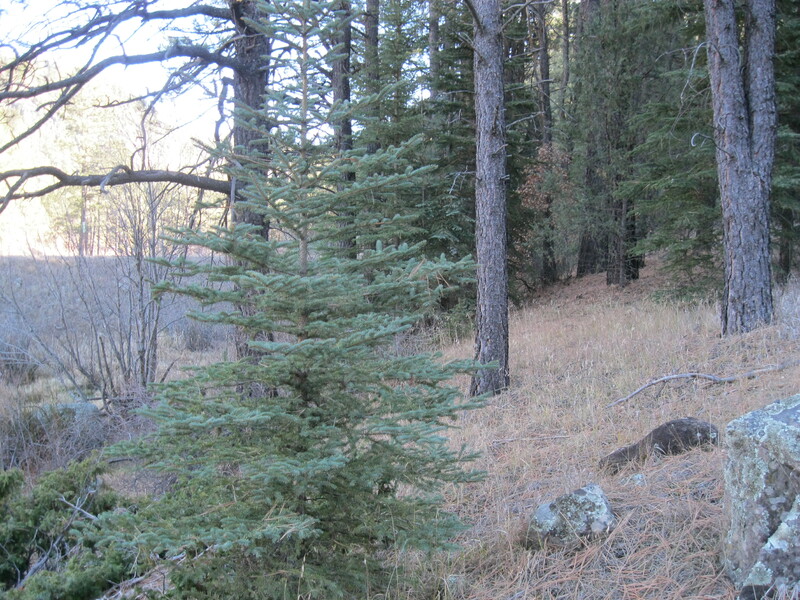 Santa Fe National Forest is selling Christmas Tree permits now and trees may be cut between November 25 and December 24, 2013. Forest Service Offices will be closed today in observance of the Thanksgiving holiday. 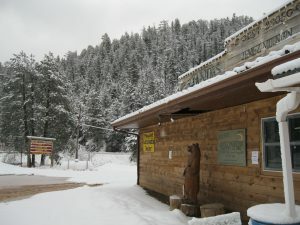 The Jemez Ranger District Office just north of Jemez Springs is also closed on the weekends. Permits may also be purchased from the Walatowa Visitors Center at the Jemez Pueblo Red Rocks next to the gas station seven days a week. The cost is $10 per tree (up to ten feet tall). For trees taller than ten feet, an additional permit must be purchased. The tags are also good to dig up a living tree. Tire chains, tow strap, shovel, warm clothing, blankets, first aid kit, matches or flares, flashlight and a full gas tank. You cannot rely on your cell phone as it will not work in most areas of the Jemez Mountains. Bring Grandma and the kids and be safe while having an enjoyable time and continuing to build family traditions. 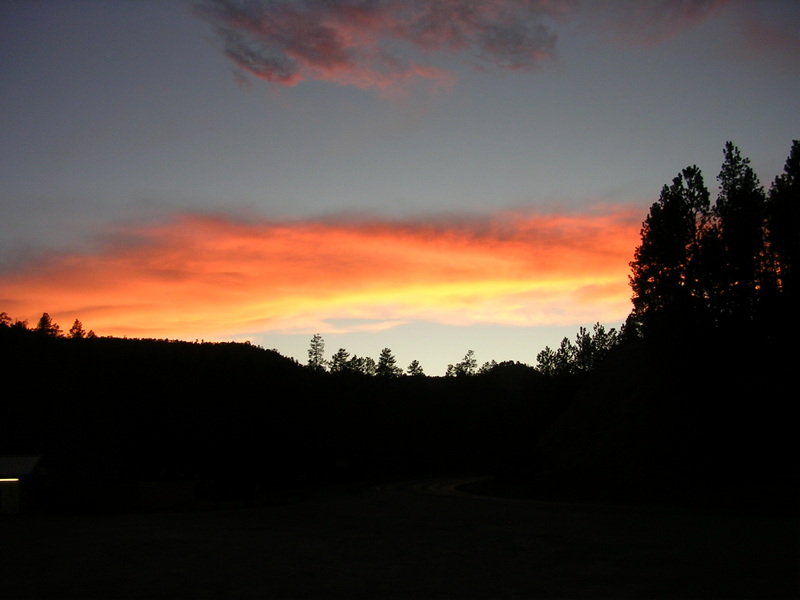 Labor Day Weekend provides for the last three day weekend of the summer and is a popular time for families and friends to enjoy their ‘last hurrah’ in the Jemez Mountains. The Jemez Mountains are beautiful right now with lots of wildflowers and damp, grass covered terrain. Although, we have had a great ‘monsoon’ with lots of rain, the forecast for this weekend is calling for warm sunny days and cool nights with only a slight chance for afternoon showers. It should be a perfect camping weekend. Fenton Lake State Park, San Antonio Campground (reservation only), along with Jemez Falls and Vista Linda campgrounds will provide opportunities for improved camping. These campgrounds will fill up fast, possibly as early as Wednesday night or Thursday afternoon. However, there are limitless dispersed camping opportunities along the forest roads. These are not campgrounds in these dispersed areas so you will have to do without picnic tables, bathrooms, neighbors (for the most part) and fees. If you need help locating these areas please stop by the store and we will be more than happy to point you in the right direction. 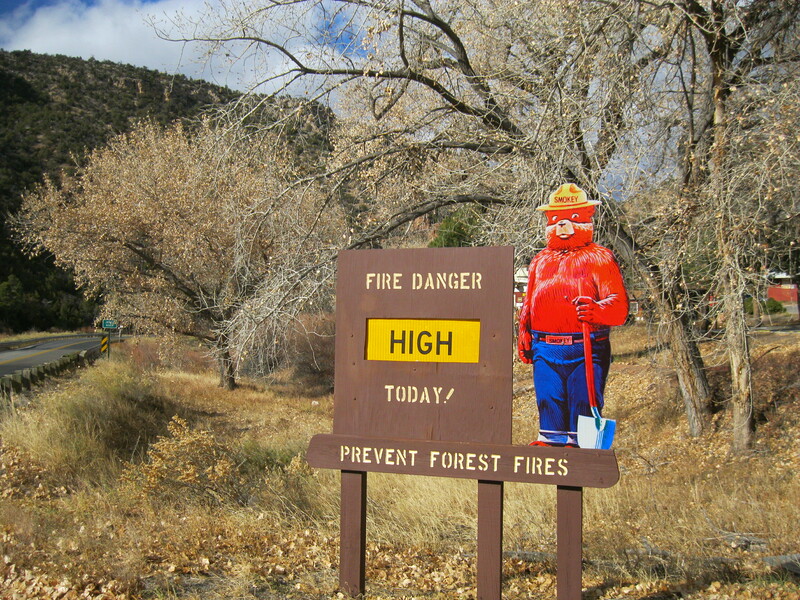 Fire danger is rated as Moderate right now and there are no fire restrictions currently within the Santa Fe National Forest – Jemez Ranger District. Enjoy your campfires, but enjoy responsibly. Fishing is improving, as most waters in the Jemez are clearing significantly. All waters are fishable now and I have heard that the hatchery truck will be out and about tomorrow (Friday Aug 30th). Even the lake is improving ( water quality wise) and most anglers are catching fish. 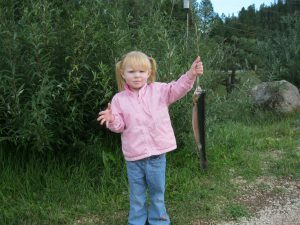 The Rio Cebolla from the lake on up to the Seven Springs Hatchery and the Kid’s Pond (11yr and younger) at the hatchery continue to provide the best fishing. Click on our ‘Fishing Report’ section for more detailed information. The East Fork corridor ( EF Trail 137) including popular hiking opportunities to the ‘cliff jumps’, McCauley Warm Springs, Jemez Falls and Spence Hot Springs, remains closed. I know a lot of folks are ignoring the closure signs, but be aware, that fines can be hefty if you are caught. The Forest Road 376 to the San Antonio Hot Springs is rough, but open. The Forest Service is really promoting the “pack it in….pack it out” philosophy, so please plan on cleaning up your campsite and hauling your trash out. We’d love to see you in the Jemez this weekend….but if plans keep you in town, please try and make time for the Lobos football team vs Texas-San Antonio at University Stadium, 6:00 pm Saturday (Aug 31). Go Lobos. The news of the Arizona tragedy is heartbreaking. My thoughts and prayers go out to the families and friends of those lost in the fast moving wild fire near Yarnell, Arizona. The Prescott, Arizona Granite Mountain Hotshots were part of our community for a couple of weeks during the Thompson Ridge Fire. They were customers of mine. They represented themselves very well. They were nice people. They are trained well to fight wild fires, to protect life and property. They are also trained well to be respectful of the communities of which they become a part. They are courteous, polite and well spoken. This is the way they all are….all of them. We had the privilege of having over a thousand of these heroes among us for over a month. We were lucky to have them. Nineteen heroes. Here one day….gone the next. Thank you for your service and sacrifice. Forest roads are open and there is dispersed camping opportunities on many of those FS Roads. Stage I fire restrictions are in effect which means no campfires or charcoal grills in the forest except designated Forest Service Campgrounds or Picnic Areas using established fire rings or grills. Some Forest Service Campgrounds (Redondo and Paliza) will not open this year, so there is a shortage of improved camping spots. La Cueva Picnic Area is also closed. San Antonio Campground (Reservations Only), Jemez Falls Campground and Day Use Area (First Come First Served), Vista Linda Campground (First Come First Served), Battleship Rock Picnic Area, Las Conchas Picnic Area and Spanish Queen Picnic Area all have designated fire rings and or grills. Fenton Lake State Park is fully open for camping, hiking and fishing (stocked with nearly 3000 fish this week). Fire restrictions are in effect, so no campfires or charcoal allowed. Gas grills and stoves are OK. Fill your water tanks in your campers and RVs prior to coming up the mountain as there are no options here. 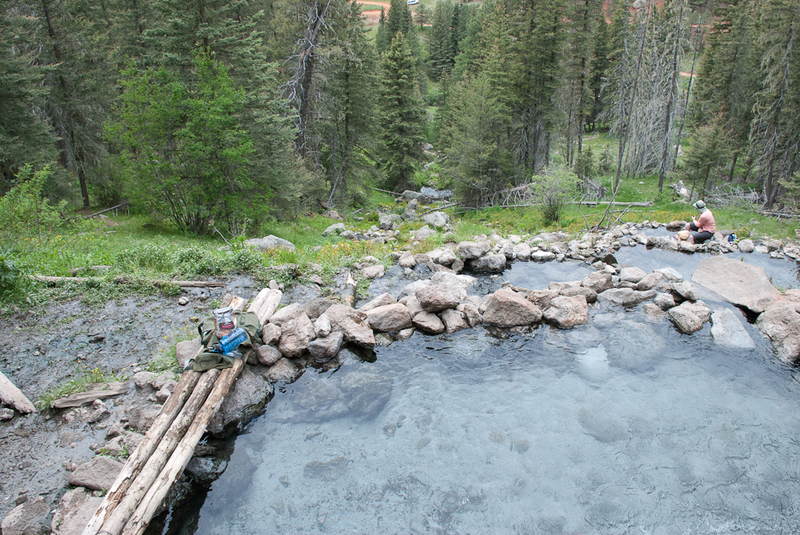 Trails to the hot springs and cliff jumps are open and inviting. While the streams are low, fishing has been great all spring. Fenton Lake has had tremendous fishing since ice off. Check our stocking report for the latest stocking information. The weekend weather forecast is calling for perfect conditions with light winds, mostly sunny skies and tempertures in the mid 70s daytime and 40s at night. The forest is DRY, DRY, DRY. TINDER DRY. Please enjoy the forest this long weekend. Enjoy it responsibly. Oh….and please stop into Amanda’s Jemez Mountain Country Store and say Hi. We appreciate your business. Although it doesn’t look like it today (four inches new snow) spring is just around the corner. Over the next few weeks school systems will take time out for Spring Break. Many families will feel the warmth of the March sun and succumb to the draw of the Jemez Mountains. Just a word of caution from JemezCentral.com. At 8000 ft in the mountains of northern New Mexico it is spring but still just a little bit winter. Camping opportunities are few and far between as most Forest Service campgrounds will remain closed until the first part of May. The exceptions being Fenton Lake State Park with six spaces However, Fenton Lake remains completely frozen and is off limits to fishing. Also Vista Linda Campground is open with 13 spaces located on Hwy 4 at MM 13.2. All forest roads are closed and will remain so until the first part of April. There are some opportunities for dispersed camping. Stop by Amanda’s Jemez Mountain Country store and we will point you in the right direction. That’s the bad news. The good news is that the new snow will melt fast and the weather forecast looks terrific for the next week of so. Many of the streams have been stocked recently and water conditions are generally good. 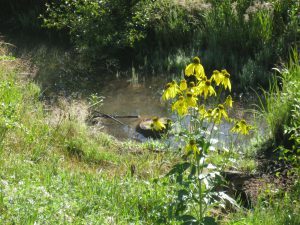 The Seven Springs Kid’s Pond is free of ice and fishing should be good for the youngsters. The hot springs are always a viable option this time of year. These are a few of the reasons to visit the Jemez during Spring Break, but just remember, we still have a little bit of winter up here. Snow? How About Some Rain? 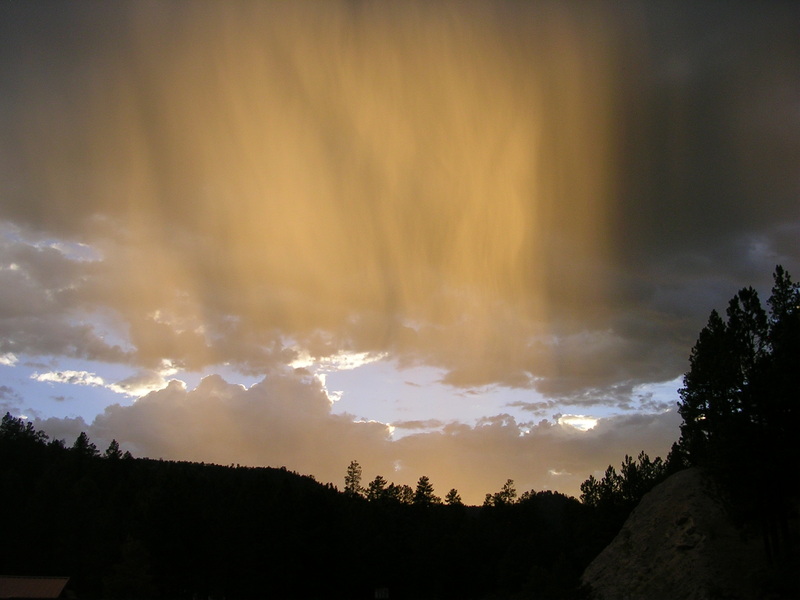 While it is not a common occurrence, rain during January at 8000′ in the Jemez Mountains, is quite rare. 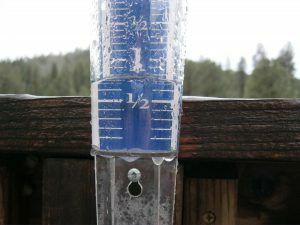 Saturday and Saturday night brought steady rain showers to the La Cueva area. According to my rain guage we received .70 inches. 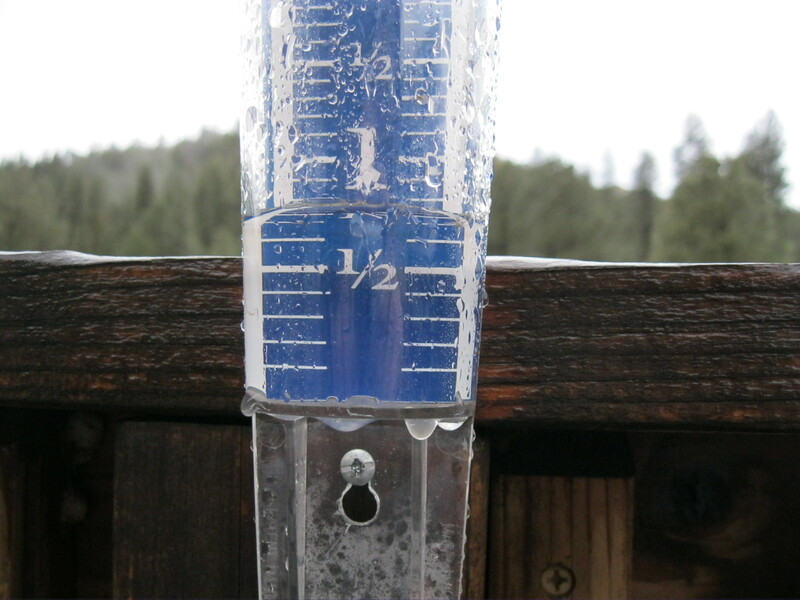 Rain in January is not ideal, but we will take all of the moisture that we can get during these times of drought. We did receive about 3″ of new snow Monday night into Tuesday.